I saw this sign in a Thai resturant in Yokneam, Israel. 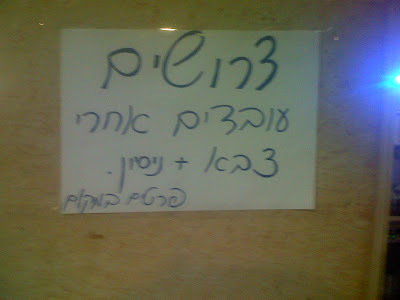 Only in Israel, you can find employers ask for waiters only after duty!! Only in this country you need to know how to use M16 in order to serve food. If it's age limitation; employer could simply say: waiters needed; must be 21 years old. only after duty means: age of no less than 21..